You are ready for real New Orleans. When the going gets tough, New Orleans gets going. If New Orleans is anything, it is resilient. You can’t keep a good city down. Hurricane Katrina struck New Orleans in August 2005, when the levees broke and the city was evacuated. The population was officially zero. New Orleans is still missing about a fifth of its population from pre-Katrina levels (100,000 people) but the city is back on the map, as vibrant and richly diverse as ever. New Orleans culture cannot be replicated. It is organic. It sprouts and blooms here. Children’s Parade in front of La Belle Esplanade Mardi Gras weekend 2019. YOU ARE READY FOR REAL NEW ORLEANS. Food, music, and Mardi Gras: these are the things that bind New Orleans citizens together. There is more, of course, but these are the touchstones that guide New Orleans every day of the year. We all eat. We all dance. The whole year revolves around Mardi Gras. Ask anyone. We’re gonna have the best Mardi Gras ever next year! New Orleans’ greatness isn’t a matter of semantics or subtlety. New Orleans is great. New Orleans culture is richly textured and densely woven. Walking down any New Orleans street is different from walking down any other street anywhere, anywhere, else in the world. There is no place like New Orleans. I’ve lived in a few other places. New Orleans reminds me of Naples. I’m not talking about Naples, Florida. I’m talking about Naples, Italy. If you think Italy is one country, you are right, politically and map-wise, but not culturally. Northern and southern Italy share a lot in common, but the values and dialects are different. No one would mistake Naples for Rome, or for Milan, or for Venice, or for Turin or Florence. No one will mistake New Orleans for New York, or for Los Angeles (LA is not L.A.), or for Boston, or for Chicago, or for Philadelphia. No one will mistake New Orleans for Houston or Atlanta. No way. New Orleans is the northernmost Caribbean city. Yet, it is still in America. New Orleans inhabits a state of mind all its own. There are two New Orleans. One is the tourist New Orleans. The other is the New Orleans its citizens call home. Both are similar but very, very different. There is nothing wrong with tourist New Orleans if you only want to skim along the surface of this world-class city’s culture and be lightly entertained. Come. 18 million people visited New Orleans last year and they had a good time on Bourbon Street. People who live here rarely go to Bourbon Street unless they work there. People who live in New Orleans inhabit the rest of the city, where the indigenous culture is born and nurtured in flowering ways. 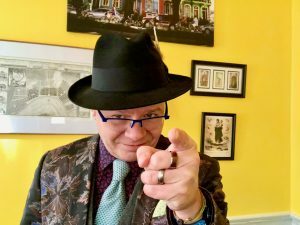 Your humble narrator, one of the most interesting men in New Orleans. Friday, March 15, 2019:. Welcome to real New Orleans. Get your good self down here. New Orleans is calling you. You know where you should stay.